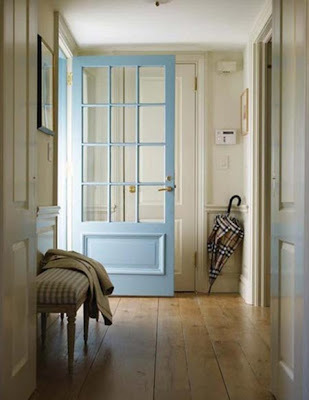 Admiring Pretty Things: What's in a Door? My friend The Huntress has a gray house and is debating what color her door should be. 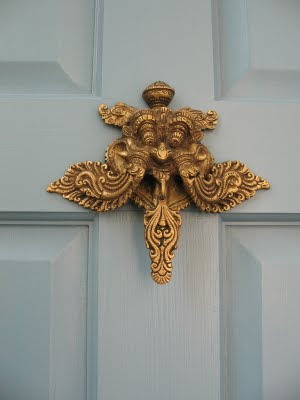 I think my new house will be white, so I am kind of stuck on this idea of a pale blue door with a large gold ornate door knocker. I think the Huntress can pull this color off with Gray too. Can't believe I am thinking about this so much. Trying to cheer myself up from the sadness I feel about leaving Chicago. A pretty blue door will help right? Last image from Chinoiserie Chic. I know I have posted this before, but it is kind of front of mind right now. Love it! 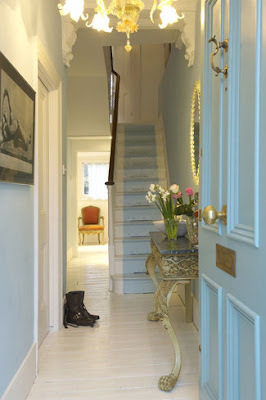 Thanks for the mention of Chinoiserie Chic and my door. Glad you like it!